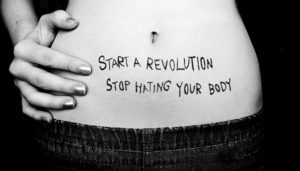 My name is Rachel LaBrie, and I wrote a blog about my struggle with my body image for PPAL three years ago. In that blog, I realize I sugarcoated a lot of things. Let me tell you the truth. Well, the full truth. I have bulimia, and have since I was seven years old. It all started in dance class. The constant pressure to be long and lean took a serious toll on my mental health, and then my physical health. I started off hiding in the back of the room, so that not as many peers could see me. That transitioned to me emotionally eating whenever I’d get anxious. And as the guilt set in, that’s when the purging started. I’ve been told seven years old is so young to form an eating disorder, but you’d be surprised. I’ve hated how I looked since I was 5 years old. It’s also a super common thing to have an eating disorder as a dancer. I probably read how to purge in a book; I was an avid reader, and I often read books meant for teenagers. I never told anyone until I was 9, and it was my nutritionist, who didn’t believe me about my bulimia. My dance teacher continued to ignore the signs. So I did what I thought would stop all that…I quit dance. However, the behavior was already developed and I just got more and more lost in my disorder. The Eating Disorder “Voice” kept telling me to eat. Chocolate, cookies, candy, whatever I could get my hands on. Then all of a sudden, “STOP!! GET RID OF IT! GET RID OF IT ALL! !” It yelled a lot. I gave in for so long. I followed my eating disorder into fire until I felt I was igniting into flames. That is until I hit a breaking point. I finally told my Primary Care Doctor, and she referred me to an outpatient eating disorder clinic. I did the Partial Hospitalization Program twice in 6 months. It really did help. I haven’t purged in about 9 months. I feel better physically, but the “voice” still comes into my head from time to time. I’ve learned some techniques to shut it up. It’s still hard. I still hate my body. I still insult it more than I should. But I recognize it does so much for me. It carries me around, lets me accomplish my goals. I need to thank my body more often for what it is, instead of criticizing it for what it isn’t. And maybe that time will come soon. For everyone who has struggled with their own body image, I stand with you. I understand how hard it is to make that negativity in your head stay quiet. But we can do this. Say something nice about your body to your body today. The littlest compliments help. It seems silly, but sometimes you need to convince yourself and your body that your body is worthy of love from you. I let my body become my enemy, but now, I feel like we are building a friendship. And I cannot even begin to tell you how good that feels. Here’s to another 3 years of growth. It breaks my heart that you’ve had to go through this. So that so many women and girls go through this. I’d be willing to bet that 100% of women don’t like at least something about their body. What does that say about the culture we live in?! I’m glad you are doing better. Feeling better. And that you have hope for the future. I’m glad that your doctor was helpful, and that you found treatment that worked. Also, thank you for being so vulnerable and brave. I hope that you are open about your story so other girls and women can benefit from it.